So you dig data and technology both. You’re considering applying for a job as a data analyst. The career is going to see greater-than-average growth in coming years. The salary is pretty sweet too. There’s a lot of competition. You must do a great job of proving that you’re better than John, Sally, and others. Do you have the right skills? How do you stand out from the crowd, and how can you prove it? First, you’ve got to get the employer’s attention with a great data analyst resume. Keep reading to find out the big data a hiring manager wants to see. 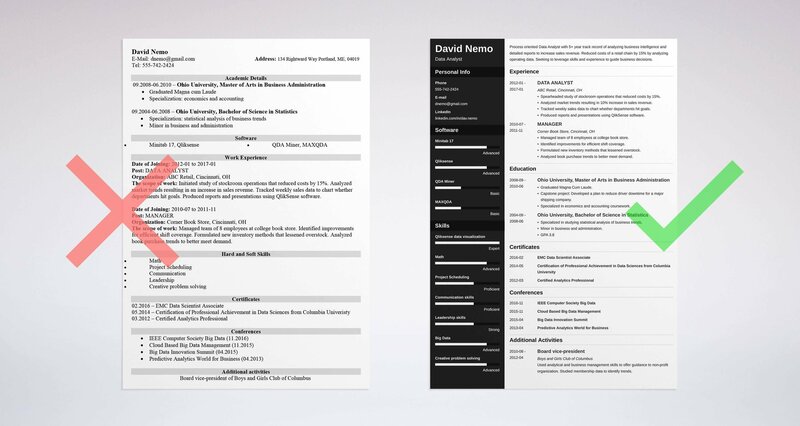 A data analyst resume example better than 9 out of 10 other resumes. How to write a data analyst resume that will land you more interviews. Tips and examples of how to put skills and achievements on a data analyst resume. How to describe your experience on a resume for a data analyst to get any job you want. Below is a sample resume for a data analyst made using our resume builder. Data Analyst Resume Example - See more templates and create your resume here. What’s the Best Format for a Data Analyst Resume? You need to pay attention to even the smallest details when it comes to making the best data science resume. How do you start writing the best data scientist resume? Use the well-respected reverse-chronological resume. This type of data science resume puts your skills and experience right up front. Remember, hiring managers often only spend six seconds looking at each resume. Being good isn’t good enough. Your data scientist resume sample must be great. Make sure to use easy-to-read subheadings, white space, and clear, legible fonts on your professional resume for a data analyst. Common advice is to save your data analyst resume sample as a PDF. That keeps your formatting intact so that the hiring manager can read your data scientist resume with ease. Pro Tip: While PDFs are usually your best choice, make sure to read the job description carefully. Some hiring managers prefer to not receive PDF data scientist resumes. You’ve got plenty of facts to put in your resume for data analyst. That includes your contact information. You want to keep it concise. You want to have more room to expand on your data analyst skills and experience. Adding your address is optional nowadays when it comes to resumes. It may even be a good idea to exclude it if the job is not local. Do not list your work email address. Avoid non-professional sounding email addresses. John Henry, 454 Wood St.., Dayton, OH, 43434, Email: JohnDigsStarWars@gmail.com, Phone: 204-854-3464. Complete a spectacular project that you want to share on your big data analyst resume? List URLs to your professional portfolio or blog to showcase your knowledge. Pro Tip: Scan your blog and social media accounts to make sure there is nothing unprofessional posted. For instance, that drunken photo of you and your pals must go. Consider directing the hiring manager to your LinkedIn profile? Make sure your data scientist resume sample is optimized before you do. Read our guide: How to Optimize Your LinkedIn Profile to Get More Jobs. Data Analyst Resume Summary or Data Analyst Resume Objective? Everything adds up when it comes to this candidate being the best fit. That’s what you want the hiring manager to think when reading your data science resume. A creative resume summary or data analyst resume objective will keep that hiring manager reading. Which one should you use? A resume summary highlights your skills, experience and achievements. That means keep it snappy and keep it short. Are you writing a junior data analyst resume? Process oriented data analyst with 5 years of experience. Experienced in interpreting and analyzing data to drive growth for a pharmaceutical company. Reduced operating costs by 15%. Furnish insights, analytics, and business intelligence needed to guide decisions. Worked as a data analyst for 5 years. Crunched numbers for a drug company to increase profits. You should use an objective if you have a resume without experience in the industry, are changing careers, or have noticeable gaps in your job history. It’s still your sales pitch, but tells who you are and why you would be a valuable hire. Are you writing an entry-level data analyst resume? College graduate attentive to sales data. Passionate about studying how to improve performance. Seeking to leverage data analytical skills to improve corporate performance as a data analyst. College graduate who loves looking at sales numbers and wants a job as a data analyst. No experience in data analysis but am a fast learner. Pro Tip: Whichever you use, keep it tight by not writing in complete sentences. Avoid personal pronouns and remove unnecessary words. 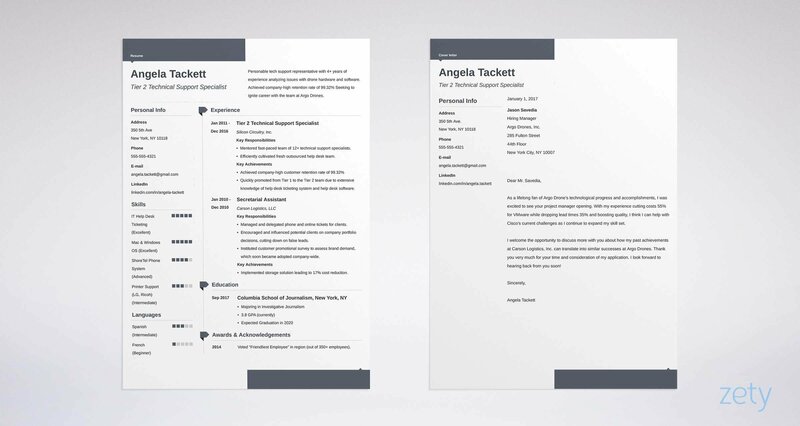 Want more examples of polished resume summaries or objective summaries? Check out our guides: 20 Resume Objective Examples – Use Them On Your Resume (Tips) AND How to Write a Resume Summary: 21 Best Examples You Will See. Start with your most recent job when listing your professional data analyst experience. List up to six responsibilities and achievements under each job. Tailor the information to fit the job description. A data analyst collects and processes data to see how to use it to answer questions and solve problems. Provide big data analysis achievements that fit. If you are writing a financial data analyst resume, give examples fitting to that kind of job. The special data analyst skills that you list on a data scientist resume will get you a better chance at the job. Make sure to also include your achievements in the data analysis resume summary. A business data analyst salary is pretty decent. Include your highlights to put you above your competition. Utilized Microsoft SPSS statistical software to track and analyze data. Designed and built statistical analysis models on large data sets using Teradata. Successfully interpreted data to identify key metrics and draw conclusions. Proposed solutions to improve system efficiencies, leading to a 15% reduction in operating costs. Used Microsoft Excel and data analysis software. Here is an example of an experience section on a Junior Data Analyst Resume. Assisted data scientists with analysis that increased sales performance by 21%. Spearheaded in-depth analysis of stockroom operations that led to a 14% decrease in operating costs. Worked closely with the company to identify customer needs and demands. Assisted data scientists by looking at retail performance. Studied how to make customers happy and reported data to store. Data analysts must communicate in a concise and structured way. Use concise bullet points that demonstrate your accomplishments. Quantify your experience. Cite numerical figures when possible to demonstrate your achievements. Use industry-specific terminology so that the hiring manager recognizes your expertise. Pro Tip: Boost your data scientist resume by completing projects that match your career goals. Focused projects may build up more data to convince the hiring manager that you’re the right choice. Remember you want to stand out from the crowd. Don’t use the same words as everyone else on your data science resume. Need some action words to help you make the best data analytics resume possible? Find them here: 80 Examples of Resume Action Words for Every Profession. Working with big data can be complex. Your resume for a data analyst job better show how you learned your skills. At a minimum, most data analyst jobs require a bachelor’s degree. Many data analysts have a master’s degree or higher. Submitting a SAS data analyst resume? Remember to include workshops and conferences where you learned SAS skills. Coursework in mathematics, statistics, and computer science all prepare you to tackle big data. An example would be if you took a course in SQL databases and database querying languages. If your education is not that advanced, place your data analyst experience in your resume first. Start with your highest degree. 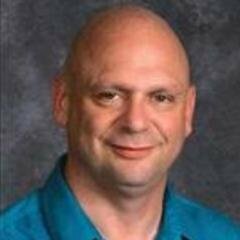 Remember to phrase your education section so it reflects the job description. Financial analysts must take coursework in subjects like economics, accounting, and risk management. Are you writing a financial data analyst resume? Capstone Project: Developed a plan to reduce driver downtime for a major shipping company. Specialized in economics and accounting coursework. Should you list your GPA on your resume for data analyst? It’s optional, though some experts suggest only adding it if you graduated within the last three years and earned a GPA above a 3.0. The best advice is to learn as much as you can about the job offer and the employer. Do your research, then decide whether this company would like to see your GPA on your data science resume. Pro Tip: List achievements that match the job description. Filing the most books on your library work study shift isn’t going to get you the job. Being a data analyst isn’t easy. It takes certain data analytic skills to both analyze big data and communicate well enough that others can understand. It’s up to your data scientist resume to show you have the skills needed to do the job. How do your data analyst skills make you different from other applicants? List your skills in a spreadsheet. Consider what skills are most pertinent to the job. Think of them like data analyst resume keywords that grab an employer’s attention. Can you work with large amounts of data like facts, figures, and crunching numbers? Do you have strong enough math skills to make estimates based on the numbers? Can you write and speak clearly to explain what you analyzed? Are you vigilant enough in your analysis to make sure you come to the correct conclusions? Can you use data warehousing and business intelligence platforms, or database querying languages? Do you question established business practices and brainstorm new approaches to data analysis? Is finding solutions based on data just a job for you, or do you have a love for it? Being a data analyst and writing an intelligence analyst resume requires certain technical skills. Power user of Excel, SAS Enterprise Miner, SQL and Minitab programs. Strong communication and creative problem solving skills. Experienced at using MS Access, Oracle 8i databases. Knowledgeable about data analysis tools. Being a data analyst or a business analyst are one of those jobs where strongly wanting to be one is not enough. You must be able to read the story behind big data and explain it clearly. Your data analytics skills section must prove you have the skills that the position requires. Pro Tip: Do not use a list of generic skills on your data analyst resume. Pick specific skills that show you have the skills needed for the job. How much do you want that data analyst job? That much? Then let’s keep boosting your data science resume. After all, you want to stand out from the crowd. This is your chance. Add an extra data analyst skills section for big data certifications, software, or licenses. List publications in which you have published research and your findings. Add a section for conferences you have attended if the conference focused on skills that match the data analyst job description. For more certifications, google data analyst to see what’s out there. Are you writing a research data analyst resume? Earned Certification of Professional Achievement in Data Sciences from Columbia University. Experienced user of QDA Miner, ATLAS.ti, HyperRESEARCH, and MAXQDA data analytics software. Scholar of the Month in data software class. What gets noticed is the data analyst resume that best matches the job description. Add data analyst resume sections that prove you are the best match. Pro Tip: The ideal software and certifications will depend on the data analyst job description sample. Make sure you list software and certifications that best match the job description. With strong data analyst resumes, who needs data analyst cover letters? Forget what you’ve heard that cover letters are no longer. Most hiring managers want to see a cover letter along with your data scientist resume. It’s so important that 45% of recruiters will toss out your resume without a cover letter. Write your cover letter to make sure it fits the job description. Do some research to find out the name of the person who will make the hiring decision. Address your data scientist cover letter directly to that person. When writing your data scientist cover letter, look at the company’s website. Be sure to include something about the company that interests you. How would you fit into that company culture? Explain how in your cover letter. Pro Tip: Remember that you want to show you’re a whiz with all things big data. Make sure your cover letter gives that impression. Being a data analyst requires very specific skills. Make sure to list your data analyst skills, data analysis education, and experience that show you are the best fit. Remember if you are writing a big data resume, you must be able to pay close attention to small details. Proofread your data analyst resume and data analyst cover letter closely to make sure you did. The biggest takeaway is to tailor your data scientist resume to the data analyst job description. If you do that, you are well on your way to grabbing the hiring manager’s attention. Do you have any questions on how to make a data analyst resume? Let us know in the comments section. An editor once said I eat, sleep and breath writing. It’s what I’ve always enjoyed doing. Whether it's my day job or a freelance gig, that makes me even more passionate about the work I do as a professional writer.